Obersturmbannführer ([ˈoːbɐ.ʃtʊʁm.ban.fyːʀɐ], lit. "senior assault unit leader") was a paramilitary German Nazi Party (NSDAP) rank used by both the SA and the SS. It was created in May 1933 to fill the need for an additional rank above Sturmbannführer as the SA expanded. It became an SS rank at the same time. Translated as "senior assault (or storm) unit leader", Obersturmbannführer was junior to Standartenführer and was the equivalent to Oberstleutnant (lieutenant colonel) in the German Army. The insignia for Obersturmbannführer was four silver pips and a stripe, centered on the left collar of an SS/SA uniform. The rank also displayed the shoulder boards of an Oberstleutnant and was the highest SS/SA rank to display unit insignia on the opposite collar. Adolf Eichmann was promoted to Obersturmbannführer in 1940 and was still listed as one in the minutes of the Wannsee Conference January 1942. 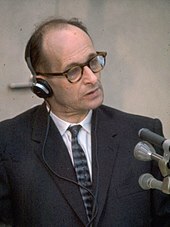 During the Eichmann trial for crimes against humanity in 1962, chief prosecutor Gideon Hausner drew attention to the significance and responsibility of Eichmann's Obersturmbannführer rank when, in response to Eichmann's claim that he was merely a clerk obeying orders, Hausner asked him, "Were you an Obersturmbannführer or an office girl?" But political theorist Hannah Arendt disputes the notion that Obersturmbannführer was a rank of significance in her 1963 book Eichmann in Jerusalem. She wrote Eichmann spent the war "dreaming" about promotion to Standartenführer. Arendt said "... people like Eichmann, who had risen from the ranks, were never permitted to advance beyond a lieutenant colonel [i.e., the rank of Obersturmbannführer] except at the front." ^ McNab 2009b, p. 15. ^ Yerger 1997, p. 236. ^ Stein 2002, p. 300 chart. ^ Arendt 2006, p. 147. Arendt, Hannah (2006). Eichmann in Jerusalem. Penguin Classics. McNab, Chris (2009b). The Third Reich. Amber Books Ltd. ISBN 978-1-906626-51-8. Stein, George (2002) . The Waffen-SS: Hitler's Elite Guard at War 1939–1945. Cerberus Publishing Ltd. ISBN 978-1841451008. Toland, John (1999). Battle: The Story of the Bulge. Lincoln: University of Nebraska Press. ISBN 0-8032-9437-9. Yerger, Mark C. (1997). Allgemeine-SS: The Commands, Units and Leaders of the General SS. Schiffer Publishing. ISBN 0-7643-0145-4.